The faceplate. On every sewing machine, this is removable, but though I hunted everywhere, I could not find a screw holding it on. There was a tiny metal bump in the middle, but it wasn't a screw. I finally took a leap into the unknown, and guessed that perhaps it just snapped on. The dirt and rust on the surface and edges was so baked on, I had to take a boxcutter and cut through it, but I finally managed to slip the blade between two metal surfaces and they separated. The other corners did the same, and we had success - the front DID just clip into place. The tiny bump secured a flexible metal tongue that seems to rest against the needle bar. No idea what that does, I'll have to wait until I put it back together again to find out. Underneath - ugh! Extremely dirty! And I'd already removed the bug nest that had been lodged in there. I've cleaned it up a bit, but still have a lot to do. Meanwhile, the face plate is clean of rust, but just dull grey now. I wonder if there's some way of polishing this? Also, I managed to get the balance wheel off. I tried to remove the big bolt that held it on, but couldn't quite figure out how. The head is round, so a wrench can't easily grip it. I sprayed in PB Blaster, but was having no luck, so as the wheel could turn but do nothing else, I thought I'd see how free I could get its motion. I squirted lots of oil on it and was enjoying myself getting to actually *spin* a bit, when to my delight, the big gear wheel behind it began to turn too! Then I realized that where the bolt ran through the wheels I could see shiny steel! A few more turns, and the whole thing detached: bolt, balance wheel and gear wheel! I'm not sure just how it happened, but it seems to have unscrewed simply by spinning the wheel backwards. The bolt is still attached to the balance wheel, but I'll see if I can remove it later. If I can't, this still seems to work. The gear wheel cleaned up nicely in EvapoRust. I noticed something interesting - the lip of the wheel is ground down or chipped off. It still seems usable, but maybe this resulted in the gears not meshing and was why the machine was abandoned. I've done a first cleaning of the balance wheel. I'll work on it some more, but I have doubts that any of the gold filigree decoration is left. As Google had failed me, I turned to the collected wisdom of The Quilting Board forum, for help in identifying this mystery machine. My first idea, that it was a Jones Serpentine, was shot down. But one poster said that he guessed that it was a Canadian machine, and that would make perfect sense, considering where I'd found it. Try as I might, I could not budge the one screw that held on the throat plate, so I started trying to remove some of the rust from the surface, in the hope that perhaps I could at least pry open the bottom half of the plate. I knew steel wool wouldn't hurt stainless steel, and anyway, so I gently rubbed it down with oil. I was pleased when an engraved number was uncovered: 418. Maybe a part number? And above it, very very faint, I thought I could see lightly engraved lettering! With my magnifying light I thought I could make out the name 'PERTH'. Now that was interesting, because Perth is a town about 50 miles from Ottawa, but it's only 5 miles from where I found the machine! It had been a railway hub back in the late 1800s, so I went online to see if I could find some reference to a sewing machine factory there. Unbelievably, I found what I was looking for in a scholarly essay from 1980. The Perth Sewing Machine Company, formerly known as J.M. Miller & Co., operated between 1872 and 1875. They produced one machine, the Venus. And there was the picture of my machine as it had once looked. I couldn't believe my luck! It looks like my machine had been bought locally and never moved away from the area in which it had been built. Considering the short time the factory had been in existence, I believe that the number 418 on the throat plate was not a part number, but a serial number. Well, this reinforced my determination to somehow rescue this sad, neglected machine. Unable to make any more progress on the throat plate, I decided to turn my attention to the underside. To my surprise, I found that the screws down there were actually capable of being turned, despite their rusty appearance. The PB Blaster is an excellent product for loosening rusty screws and gears. I was hoping that if I could remove some of the works from the underside of the machine, maybe I could get access to the throat plate from behind, and have more success getting it off. You can see how much rust there is. I managed to detach a small metal piece, but couldn't extract it because of the other gears. Removing two screws from the top of the bed enabled me to move the entire machinery on the underside, but it's still held on by some hidden screw at the far end where the balance wheel is. I'll find it some day. However, it moved enough that the rusty metal piece that had been rattling around loose fell out. And I could now see a second, smaller piece that had also been part of it, and I fished it out. Imagine my surprise when I saw that what I was holding was the original shuttle, with the tiny bobbin still inside! This shows the result of an overnight soak in EvapoRust. It definitely removes the rust, but the steel has lost its shine. I've read that rusting brings the iron in the metal to the surface, so even when the rust is removed, this blackness is left behind. Still, a great improvement over its former condition! My sewing machine obsession has struck again! But this time, I'm in deep. I'm going to try to rescue a truly antique machine; her name is Venus. I first spotted her online, in an ad on www.theauctionfever.com for an auction scheduled in Balderson, ON for the Victoria Day weekend in May. The picture caught my eye because of its rather gothic Victorian ornamentation. Look at the detail on the big wheel, and the pointy doodads around the base. 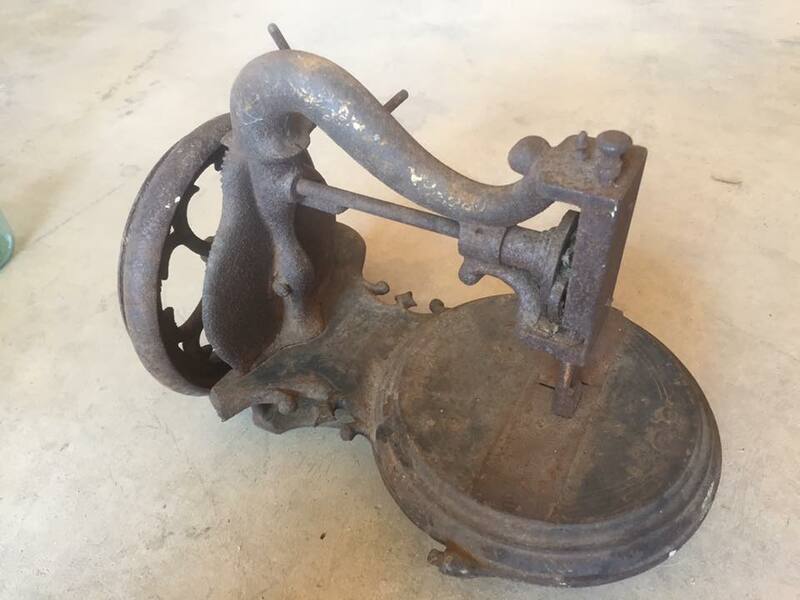 I looked at it for a long time, then suddenly realized that the thing at the front was a presser foot - it was a sewing machine! This picture was taken from the back, which led me to believe that the auctioneer didn't recognize what it was any more than I initially had. I searched online for a picture of a similar one but could find nothing. Out of curiosity, I went to the auction, on a VERY hot day, and sat through hours of sales of Amish-style furniture until this item came up. I couldn't find it at first, but finally located it, tossed in a box among some rusty old axe heads! I carefully pointed out the box to one of the auctioneer's workmen, to be absolutely sure it wouldn't be overlooked and dismissed as a pile of metal junk. Long story short, I got the box! (And I was right, they *didn't* know it was a sewing machine! They only mentioned the axes.) I brought it home in triumph, and then started taking a close look at the machine. Frankly, it was a mess. I'd never seen something so dirty and rusty. There was an ancient spider nest in the head of the machine, and bits of dead insects falling out of the innards. 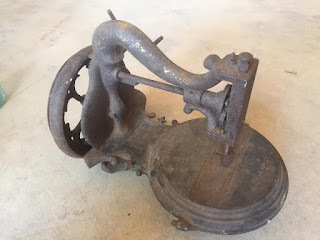 The balance wheel at the end could turn, but it moved nothing - the cog wheels weren't engaged, and anyway, they were all rusted and immobile. A few flecks of gold paint could still be seen on the serpentine arm at the top, but scarcely anything else. I'd cleaned up the old Singer, but this was a different order of decrepitude. Not hoping for much, I poured some sewing machine oil on the base and gently wiped away the dirt. To my delight, a gold floral decal emerged, practically intact! The black japanning was dull and chipped around the throat plate, but this actually looked pretty! I decided to take a chance and try to revive the machine. The decoration might be beyond saving where the rust was heaviest, but maybe... just maybe... I could get this machine to actually move again!